False teeth also known commonly as dentures have been around for many hundreds of years. 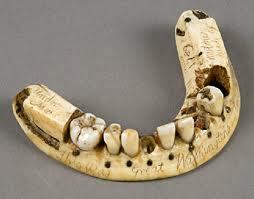 Its been shown that false teeth were used in 700 bc by Etruscan s in Northern Italy. Dentures were made of human or animal teeth. Dentures unfortunately are not the ideal solution for missing teeth. Soon after teeth are lost the jaw bone changes with bone shrinkage and this has an effect on the facial profile. It is normal to see a change in facial appearance when teeth are lost. The jaw bone has little function when natural teeth are removed and for this reason the jaw bone shrinks. 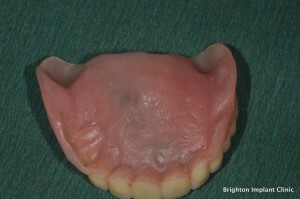 Dentures are made from accurate impressions which are taken of the mouth. Upper and lower impressions are taken in special impression materials and sent to a special dental laboratory for making removable dentures. In the lab dental technicians make dentures which sit over the gums and jaw bones. Dentures do not have much support in the mouth. The upper denture has a close seal on the roof of of the mouth. This seal enables the upper denture to stay in place. The lower denture unfortunately has no such seal so unfortunately lower dentures tend to move around a lot more than the upper dentures. Acrylic teeth are set into the dentures which will form the new artificial teeth on the denture. Acrylic teeth come in a variety of brands, shapes, colors, sizes and styles. Dentures can last up to 10 years after which they should be replaced. Due to bone shrinkage the denture will no longer fit properly and will cause irritation to the gum tissues. Fungal infections are commonly found under dentures which are not routinely removed. False teeth are not the best choice for replacing natural teeth in the 21st Century. Why are dental implants better than false teeth. Consider dental implants, these can provide a full set of fixed teeth just like natural teeth. Unlike dentures dental implants are placed into the jaw bone and are secure and stable in the mouth. Dental implants are able to support a individual or multiple teeth. If only a single tooth is missing then only one implant is needed. A single dental implant can replaced smaller incisor teeth as well as larger molar teeth. Each completed implant requires 3 parts. A dental implant, an abutment and a porcelain crown. The treatment can be carried out under local anesthetic and usually requires a minimum of three appointments. One appointment for surgery, another for impression taking and final appointment for fitting the restoration. The number of appointments can vary and in more complex cases (eg those involving bone grafting) more appointments will be required. If more than one tooth is missing then dental implants can be used to support bridge work. Similar to bridges on natural teeth. 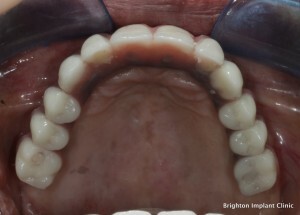 If for example 3 teeth were missing in a row, two implants could be used to support a 3 unit implant bridge. Dental implants bridges are strong secure and comfortable. 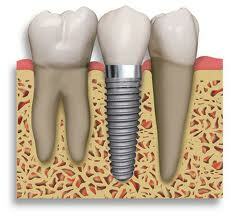 Dental implants can also be used to secure and stabilize problem dentures. These dentures are known as implant over-dentures, since the dentures fit over the implants. Implant over-dentures are false teeth which click onto implants. In the lower jaw a minimum of 2 implants would be needed in order to secure a lower over-denture. These two implants would prevent the dentures from moving while eating and speaking. 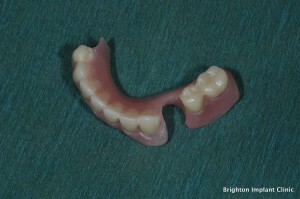 Unlike fixed implant bridge work over-dentures can be removed and are considered easier to clean. However they do require greater maintenance as the small attachments do wear out. In the upper jaw a minimum of 4 implants are needed to support an over-denture. The bone in the upper jaw generally weaker than the lower jaw hence more implants are needed for similar support. A fixed full arch implant bridge is able to replace all teeth in an arch. A minimum of 4 implants are needed to support a fixed dental bridge. Unlike false teeth a full arch implant bridge is fixed, comfortable and looks totally natural. Eating food with ‘fixed and secure’ teeth is possible again with a dental implant treatment. For more details see all on four implants. Brighton Implant Clinic has experienced surgeons and clinical staff dedicated for high quality dental implant treatment. Our clinics are based in Hove, Brighton and Hailsham. Don’t put up with uncomfortable false teeth any longer! We offer a FREE implant assessment for all new patients who wish to find out more information about dental treatment. hi, I was wondering how much the mini implants for lower jaw costs? Thank you for your enquiry, it really depends on how much bone is present in your lower jaw and also if this is the most suitable treatment for you. We usually prefer to use conventional root form implants if there is sufficient bone available for these implants. Please contact our reception for a free initial implant assessment. We will be able to provide you with a comprehensive plan to help you.